Making birthday cakes for kids is always so much fun! This cake started as a plan to be a sprinkle cake (a cake covered fully in rainbow sprinkles) but it soon evolved to include a rainbow cake topper. Even before being adorned with any other accents it is one of my favorites! It is like eating an dish of ice cream from a place that does a fantastic job with their rainbow sprinkles. 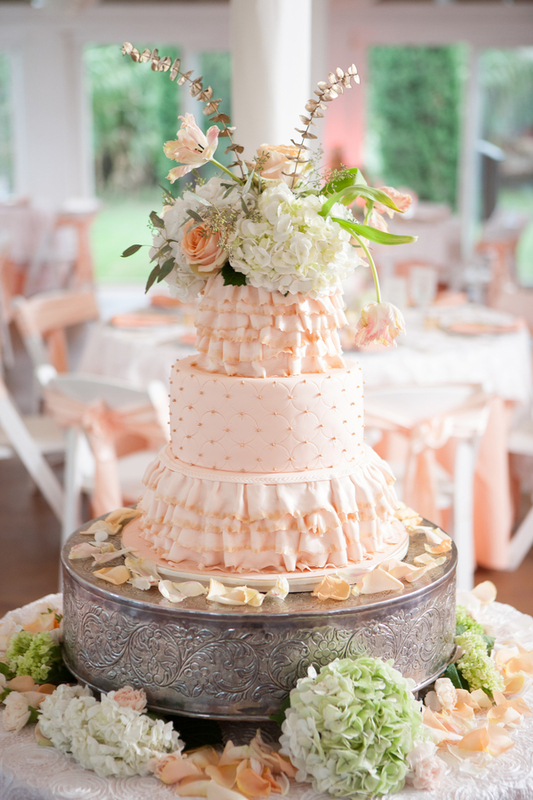 This summer, I was excited to have the opportunity to make ruffles for a tiered birthday cake. I have done some work with ruffling, but usually just one ruffle on the bottom, or something that has a lot of artistic license like a doll’s dress for a cake. For this cake, I’d need 3-4 layers of even ruffles with a slight ombré effect. This cake was for a 70th birthday! The birthday honoree loves almond, so her daughters asked for an almond cake with marzipan filling and almond buttercream filling and frosting. I received a picture of a cake for inspiration.